Central Florida Community Arts’ (CFCArts) 5th annual Summer Classical season concert will feature the Brahms Requiem. The CFCArts Classical Choir will perform the work, along with a full chamber orchestra. Said to be one of Brahms’ most popular and beautiful pieces, it overturned the common concept of a Requiem at the time (frequently associated with wrath and the day of judgement) by offering a new and positive vision, concentrating on comforting the living by conveying love and reincarnation, and offering hope and encouragement for humanity. 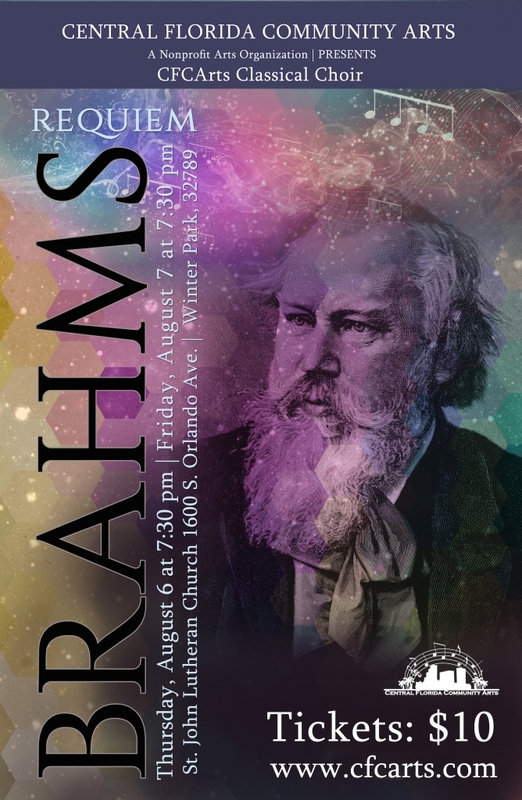 The Brahms Requiem will take place at 7:30pm on Thursday, August 6 and Friday, August 7 at St. John Lutheran Church, 1600 S Orlando Ave, Winter Park, 32789. Tickets are $10 per person and children age 12 and under will be admitted for free.